Vancouver, British Columbia is a progressive city. As an example, all re-zoned space is required to meet the Leadership in Energy and Environmental Design (LEED®) green building standard. 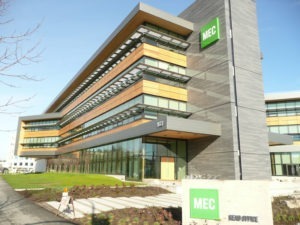 Outdoor retailer, Mountain Equipment Co-op (MEC), constructed a truly inspiring and sustainable headquarters. 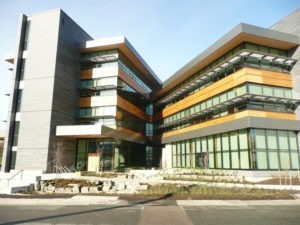 Its new head office design meets the rigorous level of LEED® Platinum. Platinum level is one of the highest green building standards in the world. Because energy efficiency is a major priority for MEC, they worked closely with architectural firm Proscenium creating a high performance building envelope. This is because a tight building envelope maximizes the effectiveness of a building’s other energy-saving features. Included are features such as a geothermal heating system, passive solar heating, and an innovative passive ventilation design. So, how did Insulspan contribute to this green building success? The Insulspan® Structural Insulated Panel (SIP) System provides a solid core of expanded polystyrene insulation. In contrast to traditional wood or metal frame wall construction, SIPs limit the thermal bridging that occurs. This means the Insulspan SIP system reduces heat loss for greater energy efficiency. Furthermore, Insulspan SIPs cut down on air leakage. This also boosts energy efficiency and creates superior indoor air quality. Inside, the design reflects MEC’s culture of active, outdoor lifestyles. Consequently, there is bike storage for 128 bikes and a bouldering “cave” for resident climbers. There are even regular fitness and yoga classes in the large multipurpose room. Above all, the 112,000-square-foot office space uses just 30% of the energy of an equivalent building constructed to the 2011 National Model National Energy Code for Buildings. Read about MEC’s LEED® certified North Vancouver store. Explore all the Insulspan advantages here.